There’s a lot of confusion out there about what exactly sheet vinyl flooring is. After all, isn’t that the cheap flooring your grandma had in their kitchen? You know the stuff. The yellowing thin sheet flooring with fake grout lines and all. Fortunately, that’s not what we’re talking about. You’re thinking of linoleum. Yeah, it’s confusing, I get it. Vinyl sheet flooring is a lot different than the linoleum and vinyl sheet flooring of yesteryear. 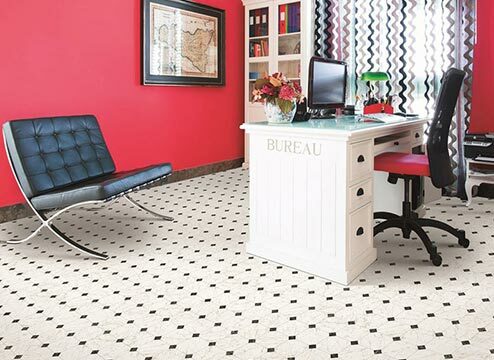 It’s actually a highly durable, multi-layer flooring that’s great for high traffic and commercial areas. It also looks a lot different than the vinyl sheet flooring from ye ol’ grandma days. 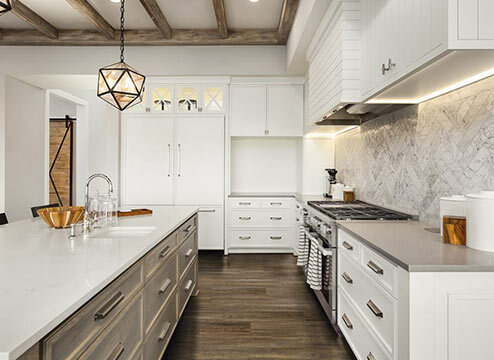 These days, sheet vinyl come in a variety of different looks: wood, stone, tile, and even more decorative looks. There’s a ton to choose from. 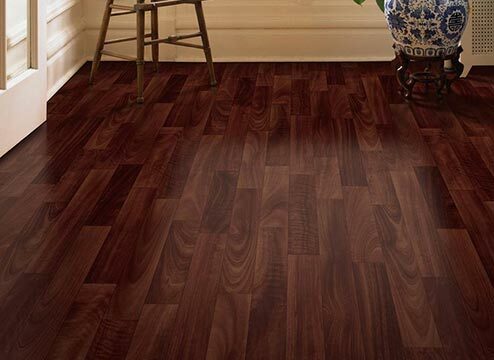 Considering vinyl flooring? Let’s take a closer look. With all the misconceptions, I sometimes wonder if it would be easier to describe what it’s not first. Sheet vinyl flooring is not linoleum. It’s also not the sheet vinyl from the 1950s. It’s a lot different than that! 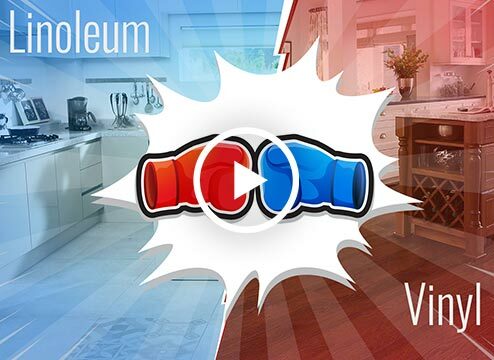 Take a quick look at our video about linoleum versus vinyl flooring (left). Now, let’s talk about what vinyl sheet flooring is. 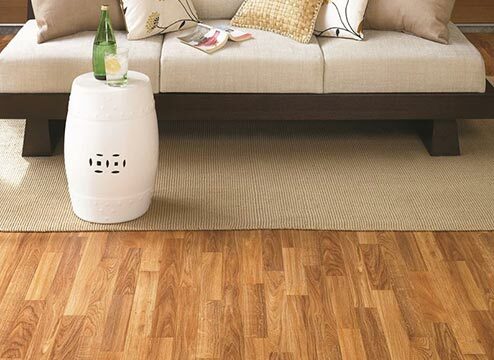 It’s a multi-layer, durable flooring that’s highly inexpensive. It’s easy to clean, modern, and a higher quality than the old stuff. It can also be installed on any level of the home, depending on the installation type. The most popular type of vinyl sheet flooring contains a fiberglass layer that lays the sheet flat and keeps it from curling. This fiberglass layer allows sheet vinyl to be installed using double-sided adhesive tape instead of a difficult glue down installation. 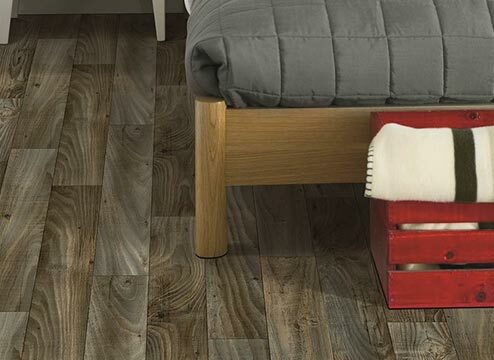 Sheet vinyl flooring also contains both a wear layer and a top coat to protect it from scuffs and scratches, much like vinyl planks and tiles. Why is the wear layer important? Well, it’s what protects your vinyl sheet flooring from surface scratches. Think of the wear layer like a bodyguard. You probably want a pretty beefy bodyguard to protect you, right? The same goes for a wear layer; the thicker the wear layer, the more protection for your vinyl sheet flooring. If you’re using sheet vinyl flooring in a low-traffic area, you might not need the thickest wear layer. However, if you’re installing sheet vinyl in a high traffic or commercial setting, you probably want an extra thick wear layer. When you’re dealing with vinyl sheet flooring, the width of the actual sheet is pretty important. Knowing the width you want can help save you time and money. One of the more difficult parts of installing vinyl sheet is making the right cuts to minimize seams and minimize waste. You don’t want to get the biggest width possible for a narrow hallway and you also wouldn’t want to get a narrow width to cover a large square room. The most common width is 12’. Style is probably the most important part of the shopping process. After all, you can pick the right wear layer and the right width, but it’s no good if you hate the look! Luckily, we have a ton of options for vinyl sheet flooring. Let’s be honest, everyone wants wood flooring in their home or commercial space. Wood does give rooms a high-end, old-school charm. However, real wood is super finicky and requires a ton of upkeep to keep it looking its best. This is where sheet vinyl comes in. Do you want a modern wood floor without all the hassle? We have gray flooring, textured looks, and light wood flooring. Basically, we have a lot of wood-look vinyl sheets; just take a look! Stone and tile sheet vinyl is also extremely popular. Some people really love their bathrooms or kitchens to have the stone look, and you can achieve that with a vinyl sheet. 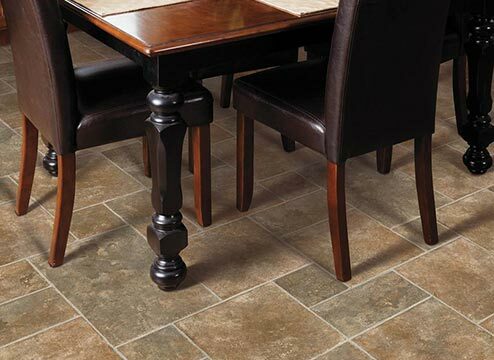 Concrete, travertine, and even marble looks are available with stone-look vinyl sheets. 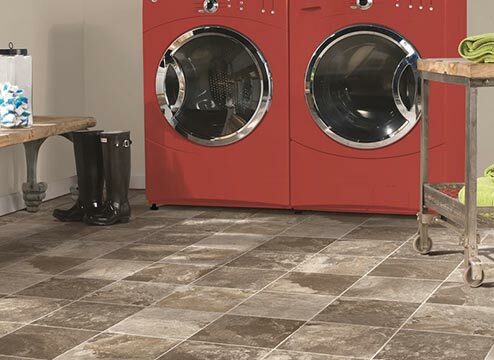 From a vintage hexagonal tile pattern, to a classic square tile, there are a wide range of stone looks in sheet vinyl. There are two main types of installation methods for sheet vinyl flooring. Every space is different and one installation might work better than other installation types. You’ll see that a modified loose lay is a lot different than a glue down installation. For both installations, we highly recommend using a pro. Precise cutting for vinyl sheets is vital and best left to a professional. Fiberglass vinyl sheets have the ability to installed in a “loose lay” fashion. That means the entire sheet does not need to be glued down. There are a few scenarios where you might choose this installation. You desire a more temporary flooring. You’re installing in a low traffic area. You’re considering DIY installing vinyl sheet flooring. This installation is not great for high-traffic areas. Sure, you can add more tape to better secure the sheet, but really, high-traffic installations need to be glued down. For a modified loose lay installation, double-sided tape is used around the edges and under seams of the vinyl sheet. This secures it in place. This type of installation is used on fiberglass vinyl sheets, but also other types of vinyl sheets. It’s more of the traditional installation method, and typically a professional is required. With this type of installation, an adhesive is spread over the subfloor and the vinyl sheet is placed over it- carefully avoiding trapped air. A glue down installation is the best for high-traffic or commercial installations. Q) How do I clean sheet vinyl flooring? A) You can clean sheet vinyl flooring by sweeping and vacuuming any loose crumbs, dirt, or debris from the flooring as necessary. Use a light damp mop to remove any spills or stains as necessary. Be sure to clean up any spills immediately to prevent staining or discoloration. Q) Can I install sheet vinyl flooring myself? A) If you have some experience installing flooring, you may be able to install sheet vinyl flooring yourself. However, we usually recommend you leave this up to a professional. Cutting sheet vinyl flooring precisely is essential to a correct install and it’s best to leave that up to the pros. 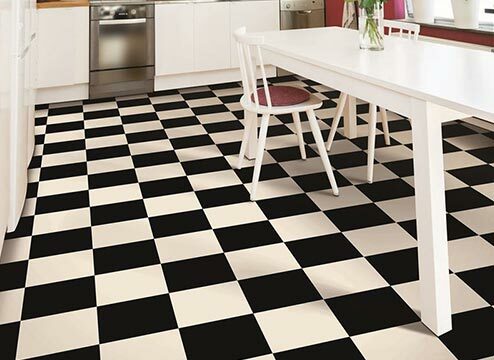 Q) Where can I install sheet vinyl flooring? A) Sheet vinyl flooring can be installed basically anywhere you have a level subfloor. It can be installed even over some flooring! 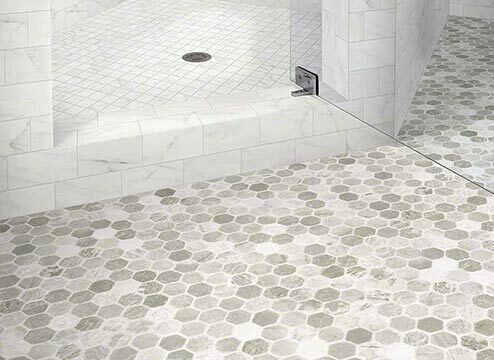 Feel free to install sheet viny flooring in kitchens, living rooms, bedrooms, basements, and even bathrooms. Curious about what others think of vinyl sheet flooring? Check out a couple vinyl sheet flooring reviews. Mohawk Fieldcrest Fiberglass Vinyl Sheet"
By now, you probably have a good idea about whether or not sheet vinyl flooring is right for you. Luckily, you have may vinyl choices to choose from!